¡Enviamos para todo El Salvador! A steady broadband connection greater than 5Mbps is highly recommended. Sony's PlayStation Vita, previously codenamed "Next Generation Portable", is the successor to the PlayStation Portable hardware series. 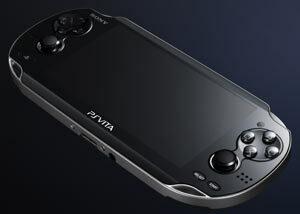 Vita retains the familiar general form of the PlayStation Portable hardware series while dramatically improving on virtually every aspect of its use with powerful and exciting new features including: dual touch pads at the front and rear, dual cameras at the front and rear, dual analog sticks, a 5-inch OLED screen, six-axis motion sensors and a three-axis electronic compass and exceptional built-in connectivity via Wi-Fi. Taken together this makes for a handheld gaming device that truly signals the entry of handhelds into the world of Next-Gen gaming. Sony's PlayStation Vita, previously codenamed "Next Generation Portable" (NGP), is the long-rumored successor to the PlayStation Portable hardware series. PS Vita retains the familiar general form of the PlayStation Portable hardware series while dramatically improving on virtually every aspect of its use with powerful and exciting new features including: dual touch pads at the front and rear, dual cameras at the front and rear, dual analog sticks, a 5-inch OLED screen, six-axis motion sensors and a three-axis electronic compass and exceptional built-in connectivity via Wi-Fi. * Taken together this makes for a handheld gaming device that truly signals the entry of handhelds into the world of Next-Gen gaming. Handheld gaming enters the Next-Gen. Blur the Lines Between Entertainment and Reality. PlayStation Vita is designed to blur the lines between interactive entertainment and reality in a variety of ways. Reaching beyond the capabilities of every handheld gaming console that has come before it, in this model of Vita players have access to a vast amount of content via improved Wi-Fi, allowing for maximum connectivity wherever you go. (An additional Vita model allows for Wi-Fi and always-on 3G connectivity**) Its 5-inch OLED front multi-touch display brings brilliant images to life and allows for a new touch driven navigational system, while the additional multi-touch pad on its back surface will allow users to interact with games and characters that they encounter within them with a simple movement of their fingertips. The real world and the game world are seamlessly merged with front and rear camera enabled augmented reality. Additionally, services created specifically for Vita will be available on PlayStation Network. These services are designed help users take their gameplay, as well as interaction with other gamers, to new levels. Additional features include: dual analog stick controls, a 4 core CPU, system-specific flash card media support for game and media saves, mobile PlayStation trophy support, built-in three-axis gyroscope, three-axis accelerometer and functionality. 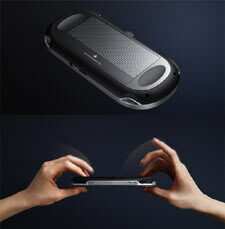 New controls include dual analog sticks, three-axis gyroscope and accelerometer and 2 cameras. Superior design features, including touchpads at the front and rear. New dedicated flash-based game medium, with one slot for game content and a second for personal content. The best in content, from classic PS One games to your favorite franchises and new ones going forward. "Near" is a core PlayStation Vita feature composed of location-based services, that utilize PlayStation Network. Near, developed specifically for this service and the network, will be pre-installed in the system to let users find out what their friends in the vicinity are playing now or what they were playing recently. Users can meet their friends and new players virtually, regardless of what games they are playing, simply by sharing their game information across different dimensions of time and distance. Every game title for PlayStation Vita will be provided with a space called "LiveArea" where users can share the fun and excitement with other players. Users will have access to the latest information of games provided from SCE and third party developers and publishers through PlayStation Network. Additionally, Vita users will be able to view "Activity Log" which is constantly updated with accomplishments from users who are playing the same game, which in turn can trigger active real-time communication among users. In addition to containing the best in new handheld gaming hardware technology, Sony's PlayStation Vita provides users with the best in quality content. All your favorite game franchises are coming to Vita, including but not limited to Uncharted in Uncharted Golden Abyss, LittleBigPlanet, Hot Shots Golf, ModNation Racers, Wipeout and many more -- including all new game launches -- yet to be announced. Joining these new offerings, players will also have full wireless access to the PlayStation Store. Here, via Vita's improved Wi-Fi capabilities owners can download new game add-ons, movies, comics and PS One classics ported over for handheld play. PlayStation Vita also features full backwards compatibility (via download) to all PSP games. Together this powerful merging of hardware and software is destined to create entertainment experiences unlike anything else available in the handheld gaming market. 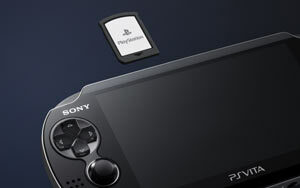 Free PlayStation Network access, including trophy support and new Vita features "LiveArea" and "Near"
* Connectivity subject to Wi-Fi availability coverage limitations. ** 3G functionality and coverage requires purchase and activation of an additional AT&T data plan. Connectivity subject to 3G coverage limitations.